Operencia: The Stolen Sun is a turn-based fantasy RPG that exists in what is becoming an ever-emptier niche: budget games that hide their limitations and make up for their modest production values with reasonable, attainable ambitions and high-quality follow through. In the case of Operencia, impressive environments, interesting puzzles and well-written dialogue go a long way in enhancing what is so often a dreary, bargain bin experience in this share of the market. The basic gameplay loops and mechanics of Operencia reflect a “if it ain’t broken, don’t fix it” approach to turn-based role playing. From character creation to gathering a balanced party, from the combat which features ranged and melee attacks to spells, buffs and all the rest, Operencia will be a comfortable and familiar experience, albeit one with specific lore and color. Standard, too, is the grid-based system of enemy encounters, though Operencia does a better job than many such games in managing the flow of combat from one team member to another and keeping track of available actions. I was attracted to screenshots of Operencia’s environments and I was not disappointed. 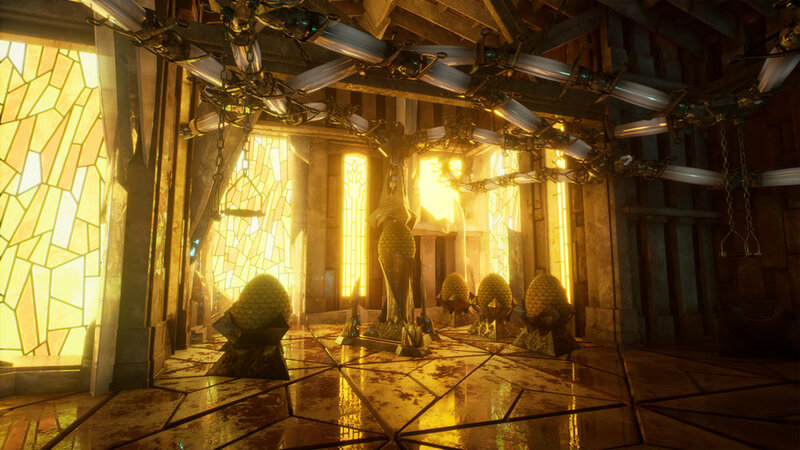 Thanks to some sharp textures, effective and colorful lighting effects and overall excellent art direction, the game has a variety of impressive outdoor and dungeon settings, including an early, underwater dungeon that is quite unique. Although character movement is grid-based, the game does a a very good job of minimizing this limitation through the use of a flexible camera and fluid transitions. There is some pixel hunting to find puzzle solutions and now and then the restrictive movement feels frustrating but I largely came to ignore what is of course baked into the mechanics of many older RPGs. Enemies are a mixture of human, humanoid and fantasy characters and although most are based on pretty familiar fantasy tropes, they are animated well in combat. In general, battles comes across as being pretty easy but there is a gentle rise to much more formidable encounters and genuinely challenging bosses. 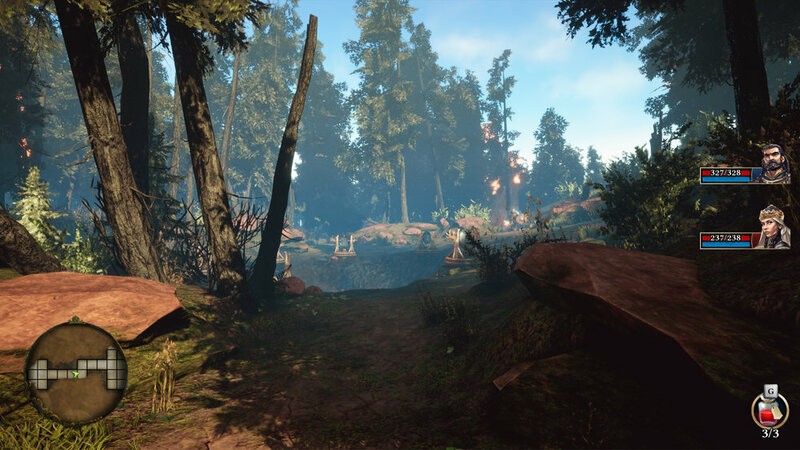 Likewise, Operencia’s environmental puzzles range from obvious to deviously difficult. Operencia begins on a serious note that does not hint at the humor and satire which is just around the bend. Humor is notoriously, almost impossibly difficult to pull off in games but Operencia finds just the right tone in its dialogue, aided by voice acting that ranges from acceptable to excellent. Stories are told and heroes assembled around the campfire, but it’s disappointing that the story beats and character interactions are told through static illustrations and not animations. The overarching plot is a rather well-worn scaffold on which to hang a tale, but it does a decent job of moving the action forward. Operencia: The Stolen Sun should appeal to a range of gamers: fans of well made, turn-based RPGs and anyone looking for a budget title that hasn’t compromised graphics or mechanics will also appreciate it. The game doesn’t take a lot of chances but there is plenty of depth and replayability in its character leveling and crafting systems and while it may seem easy in the first few hours, combat difficulty increases and the puzzles become challenging as the game progresses. City of the Shroud is not primarily a comic game. It is a semi-turn-based tactical fantasy RPG in the same gameplay ballpark as The Banner Saga or X-Com. Unlike those games, however, City of the Shroud almost immediately breaks the reality logic wall, with characters telling each other what to do in terms of using controller inputs. Whether as history lesson, exercise in nostalgia, or appetizer to the upcoming fourth entry to the series, The Bard's Tale Trilogy remains engaging. It requires a lot of patience and attention to detail and a special love of character micromanagement and, although the rerelease is more colorful than the original, the graphics and core gameplay are still rooted in the limitations of 1980s technology. Although Ashen is one of the better Souls-like games, its strengths emerge the more it deviates from the template. With a distinctive art style and approach to co-op, base-building and character interaction, Ashen suffers in those areas in which its Souls model outshines it: fluid and varied combat being the most obvious area. Taken apart from its inspiration, though, Ashen is still an entertaining and elegant experience.